I’m sorry, but after this morning’s fact-checking debacle, I just couldn’t resist. I was able to confirm this claim on a few different websites, although , as usual, not one listed a patent number I could verify. Naturally, I started tracking down what I’d only imagine would be a very neat patent to share with you all. I mean, what’s the fun of sharing history if it doesn’t come with pictures? But all my searches of Google patents, the USPTO, and everywhere in between turned up nothing. 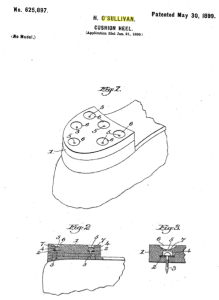 I had already pretty much confirmed that Irish immigrant Humphrey O’Sullivan had haphazardly invented the rubber sole in the late 1890’s, but the patent I kept finding wasn’t one with an ISSUE DATE of January 24, as so many sources claim. So, I accepted that the date which had been shared time and again throughout the internet was wrong. Ok, fine. The internet is wrong. It happens. And so, I started writing this post about how the internet lies and how I had the REAL answer to when O’Sullivan invented the rubber shoe sole. Then, just as I was about to post my fun little story, my gut made me search one more time. 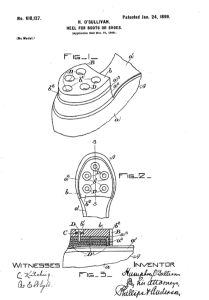 Not one, but TWO “rubber sole” patents ISSUED to Humphrey O’Sullivan on January 24th, 1899. One of O'Sullivan's two original rubber sole patent, both issued January 24, 1899. So yes, Virginia, it is true. 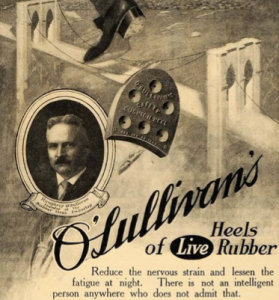 As waves of relief over the internet not being a liar (this time) sweep over me, I am happy to inform you that, Today in Invention History, Humphrey O’Sullivan patented the rubber sole. As the story goes, O’Sullivan got the idea when fellow employees at the Massachusetts print shop where he worked kept stealing the rubber mat he used to stand on for comfort. So, the perspicacious printer cut himself two pieces of the mat and tacked them to the bottoms of his shoes. Both the January 24th patents and the January 21, 1899 application have eerie similarities that could confused even the most seasoned fact checkers. And, if it wasn’t for one last-ditch search, and some loyal attention to my gut, I might have had to tell you nothing was invented today. Which of course, would be a lie. And we all know, the internet has enough of those already.